Acting Up with Jamie Crick, a brand new podcast, is devoted to the wonderful world of musical theatre. Fabulously well informed and frequently hilarious, it’s everything you need to know about what’s hot in the West End and beyond. Jamie Crick (Jazz FM, Classic FM, Encore) will be joined in the studio by the West End’s hottest talents, Kerry Ellis (Wicked, We Will Rock You) and Jonny Bunyan (Theatre Commentator), who’ll be going behind the scenes at some of the best known venues in the UK. More than just the music and the plays of theatre, but now the gossip, the people on and backstage too. This – as a podcast – is the first of its kind, and is set to delight its audiences. 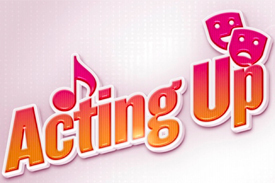 Acting Up with Jamie Crick will also head backstage to meet some of the West End and UK theatre’s unsung heroes. From follow spot to front of house, stage manager to the costume department: Jonny and Kerry will find out just what goes into making a show come to life. There’s nothing quite like a night out at a West End show and there’s no panel better equipped to keep audiences informed and entertained than this one. Acting Up is the ninth podcast from Muddy Knees Media, following on from The Totally Football Show, The Totally Football League Show, Golazzo, Parts Unknown, The Bradley Wiggins Show, The Totally Scottish Football Show, The Totally Football Show: American Edition and Series Linked. It is the first outside the foray of sports for Muddy Knees Media, and began on 9 January. What a fabulous start to the new year! Audiences can subscribe on Apple Podcasts and all good podcast providers.